PlugPv is a local solar installation company focused on bringing you easy and affordable customized solar options for your home. We are a full service turn key installer. We’ll handle the project from the initial consultation with one of our senior solar consultants all the way through final inspections and commissioning. We have multiple options available including purchase, Lease, and Power Purchase Agreement (PPA). All options allow our customers to go solar with no money down, and start saving money in year 1. For every member or supporter of your registered non- profit organization that signs up for a free-in home consultation, PlugPV will donate $50 to your organization. Every homeowner that gets a solar system installed by PlugPV, the organization will receive a donation of $500. 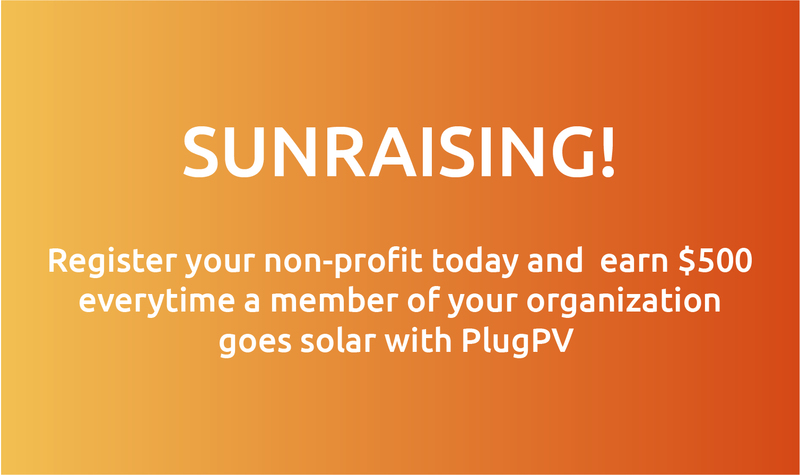 By partnering with PlugPV Solar, you can now use the power of the sun to help reach your organization’s fundraising goals. It’s a win – win – win!